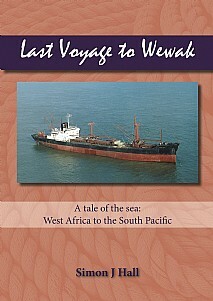 Expelled from Indonesia as an undesirable, medically discharged in Honolulu, confined in Nigeria, Hall’s turbulent life takes him from West Africa to Japan, from Europe to the Persian Gulf to the South Pacific. At last a Master Mariner, he serves on one last break-bulk general cargo ship, before transferring to the new maritime world. The prose is as elegantly expressed as in his earlier works. Steaming along the Yemeni coast, he writes: The bleakness of the South Yemen coastline made the green sea seem sharper in contrast, almost emerald in colour. The sun sat as a bright white orb in a blue white sky, the colours scourged out by dust blown offshore from the desert interior. In a typhoon near the Macclesfield Bank: Us; wild-eyed in the wheelhouse, braced against the forward bulkhead, awaiting our fate, helpless against a show of nature’s fickle anger that could take us down among the fishes before we could cry Noo-ooooo… Maturity and marriage finally see off his tendency towards alcohol abuse: I began to yearn to make myself a better person and abandon the self-serving creature I had become. Wistful, unvarnished, droll, in powerless rage against the changes, this is an important companion to Hall’s previous acclaimed books, a fine work that captures, in arresting style, the life of men who go down to the sea in ships. This well-written book will appeal to all who are interested in ships and shipping, modern and maritime history, and those who enjoy well-told travellers’ tales of fascinating people and places.